Despite their sometimes fluffy reputations and occasionally ethically compromised viewpoints, tech evangelists are important, don't let anyone tell you otherwise. The right passionate voice behind the right technology platform or piece of hardware can sometimes spell the difference between fostering a community of potential users and watching a product die on the vine. Which leads us to our topic today: Microsoft co-founder Bill Gates and the company's flagship augmented reality product, the HoloLens. Although it's true that Gates retired from day-to-day responsibilities at Microsoft years ago (he continues to serve as the company's technology advisor), he nevertheless remains a potent voice regarding the future and how we use software and hardware to fulfill our potential. Therefore, given his role as a tech pioneer and his ongoing passion regarding innovation as exampled by his frequent posts on his personal blog and on social media, you would think he would be one of the leading advocates for Microsoft's HoloLens. But all it takes is a little looking around at the past few years of his public appearances and comments to realize that, no, that's not the case. Not even close. In fact, you'd be hard-pressed to find hardly any mention of the HoloLens in any of Gates' public comments. "The Hololens is pretty amazing. Microsoft has put a lot into the chips and the software. It is the start of virtual reality." Of course, Gates is effectively in retirement mode, spending much of his time on philanthropy and travel. But it's still incredibly odd to watch Microsoft make such a strong push behind the HoloLens and then suddenly realize that the most high-profile voice connected to the company next to the company's CEO, Satya Nadella, appears to be, for some reason, almost completely ignoring the device. Meanwhile, a growing number of passionate developers quietly work behind the scenes to create apps and tools that may ultimately push the HoloLens version of augmented reality into the mainstream. The questions about Gates' position on the HoloLens first popped into my mind last month when he served as the guest editor for Time magazine. The issue featured an augmented reality component that was promoted as available on the LifeVR app on iOS and Android. Specifically, the site urged readers to "watch these and the rest of the AR features in the magazine at home, download the LIFE VR app for iOS and Android." But the promotional effort supporting the special Gates issue made no apparent mention (as of this writing) of any HoloLens version of the Life VR app. (There is a Windows Mixed Reality version of the app for VR headsets, but that's not for the HoloLens). OK, maybe that was just a smartphone app priority/preference move on the magazine's part. But then I took a look at Gates' very active Twitter feed and personal website and wasn't able to find any HoloLens mentions in those places either. One might be led to think, well, maybe he's just not into immersive computing. Wrong. In fact, Gates appears to be completely infatuated with virtual reality. He even has a regular VR video series in collaboration with Samsung VR (if you need help getting started, there's also a special VR setup page on his personal site). Not only can you find Gates happily wearing a Samsung Gear VR headset on his Twitter feed, you'll also find him wearing an HTC Vive headset on his YouTube page (see video below). After many searches in various other places on the interwebs, I couldn't find any photos of him wearing a HoloLens. Surely there's one (or more) photos of him wearing the Microsoft device out there in the ether, but they aren't easy to find. 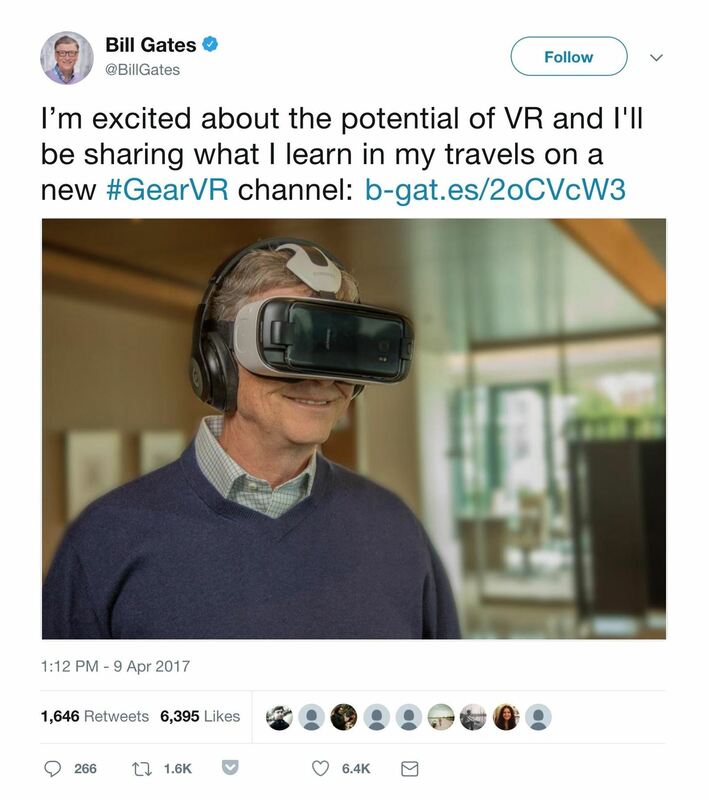 So now we know that Gates loves VR, and doesn't talk much about the HoloLens. Fine. But what about when he does talk HoloLens? What does he think about the device? I had to go back several years to find the answer to this question via a Reddit AMA session held in Jan. 2015, around the time of the first HoloLens announcement. A Reddit user asked: "What do YOU think about the new Hololens? Have you tried them out yet?" Gates' answer: "The Hololens is pretty amazing. Microsoft has put a lot into the chips and the software. It is the start of virtual reality. Making the device so you don't get dizzy or nauseous is really hard — the speed of the alignment has to be super, super fast. It will take a few years of software applications being built to realize the full promise of this." It is the start of virtual reality? Sure, you can forgivingly parse those words to mean a lot of different things regarding the future of immersive computing, but the bottom line here is that this is what he said when asked about the HoloLens, an augmented reality device. Yes, it was early days for the HoloLens, and maybe he was still forming an opinion on the device. But still, he essentially changed the subject. And then, in 2016, at the annual ASU + GSV Summit, when asked, "Do you think the embrace of these new technologies — virtual reality, augmented reality — are going to accelerate the adoption of personalized learning?" Gates responded, "Yes, I think virtual reality can make things more engaging. And there are certain things where you have more of a sense — even if you can't, say, build a car in the virtual world, you can sit there and put the pieces together and almost feel like you're doing far more than would be practical in the real world." No mention of AR. No mention of the HoloLens. More than a year after the reveal of the HoloLens, Gates was still responding to HoloLens questions with VR answers. Look, maybe Gates has five HoloLens devices at home that he uses every day. Maybe he has a team working on a "Gates Notes" HoloLens app at this very moment. And to be fair, he's already put in his work building Microsoft into the behemoth that it is. He doesn't really owe Microsoft, or its users, any more of his precious time on this planet. But when someone so integral to Microsoft's history and success is so public about his enthusiasm and engagement with VR but has almost nothing to say about the HoloLens, it's fair to begin wondering: Does Gates believe in the Microsoft HoloLens? They say if you have nothing nice to say, say nothing. In this case, Gates' silence on the HoloLens has become deafening.